Spotify is really great as it allows us to enjoy millions of songs with a free account without paying a penny. However, Spotify Free also comes with boring ads, forced shuffle play, low quality music without offline accessibility. All of the restrictions serves for the ultimate goal - paying for premium subscription. If you want to download Spotify music as MP3 under any circumstance without paying for premium subscription, do not miss the top 5 Spotify music downloaders we list below. They are 100% working and secure and they could be software programs, browser plugin and online website. The top one we want to recommend to you is TuneMobie Spotify Music Converter. Spotify provides two tiers which are Spotify Free and Spotify Premium for individuals. With Spotify Free account, you can listen to over 40 million songs, but it also comes with various limitations to urge you to upgrade to premium subscription. 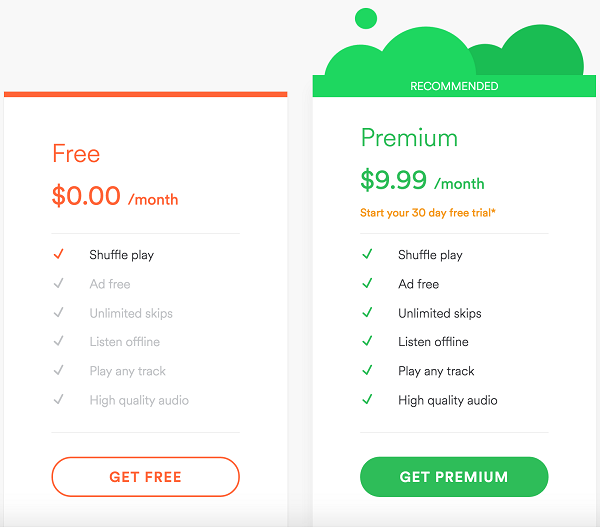 Below is the main differences between Spotify Free and Spotify Premium. With Spotify Free, you can only enjoy songs with an internet connection and you are not entitled to download songs for offline listening. You will be forced to use shuffle play mode, ads will be inserted every 3 or 4 songs, and audio quality at 160kbps is much lower than 320kbps of premium account. Besides, part of the songs are not available for free users. And if you don't like the songs, you can only skip 6 times in an hour. Of course you can pay for premium subscription to get rid of the limitations, but even with Spotify Premium, you can only download protected Ogg files which can't be played on iPod Nano/Shuffle, Sony Walkman and various MP3 players. Is there any way to download Spotify songs as MP3 eve using a free account? Sure, that is what we want to introduce here. We are listing top 5 spotify music downloaders which TuneMobie Spotify Music Converter, Leawo Music Recorder, Apowersoft Streaming Audio Recorder, Spotiload and mp3fy.com. Among the choices, there are Windows/Mac programs, Chrome browser extension and online website. So it can meet your requirements of downloading Spotify music under different circumstances. 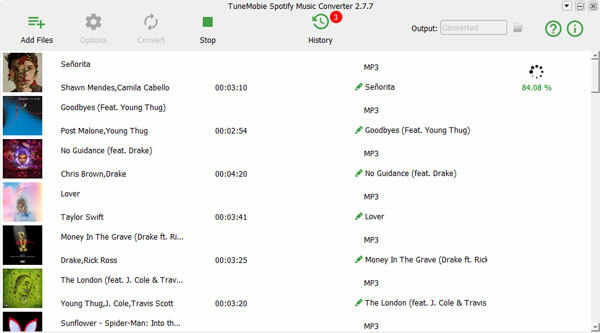 TuneMobie Spotify Music Converter is a dedicated Spotify Music downloader which you can use to download Spotify songs, albums and playlists as MP3, M4A, WAV and FLAC. All downloaded songs will preserve ID3 tags and metadata information. You can either drag songs, albums or playlists from Spotify to Spotify Music Converter, or copy link in Spotify and paste in Spotify Music Converter. Provide flexible pricing options at $19.95 for 1-year license, $39.95 for lifetime license and $79.95 for 5 computers. 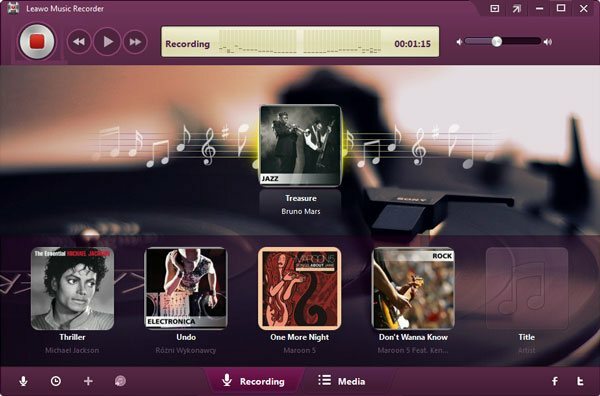 Leawo Music Recorder is a lightweight and easy-to-use music recorder for local songs and online streaming audio. It can record songs from Apple Music, Spotify, YouTube and many websites and streaming music services, save songs as MP3 or WAV. Leawo Music Recorder can get ID3 tags from internet, add them to recorded songs and allows you edit ID3 tags manually. Leawo Music Recorder can automaticaly split songs by specifying a silence duration. 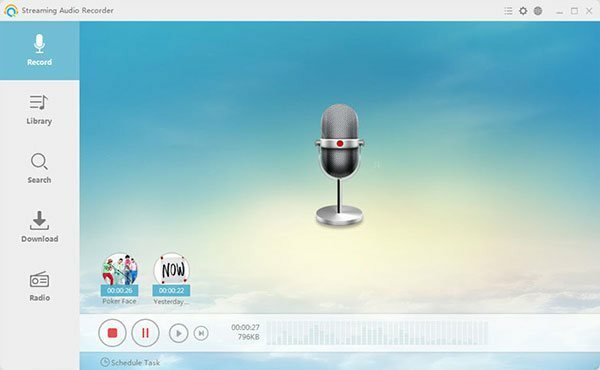 Apowersoft Streaming Audio Recorder is also an audio recorder for recording audio and music from local computer, Apple Music, Spotify and other music services. It also integrates with audio converter, audio editor, video to MP3 converter, ID3 tag editor, CD burner and CD ripper. For recording audio like Spotify, it provides MP3, WAV, AAC, OGG, WMA and FLAC as output formats. Besides, it provides many radio stations from different countries. Spotiload (former Spotify VK Downloader) is an extension of Google Chrome browser and a search popup for free music. It uses vk.com social network to find and download tracks with matching name from any Spotify playlist. 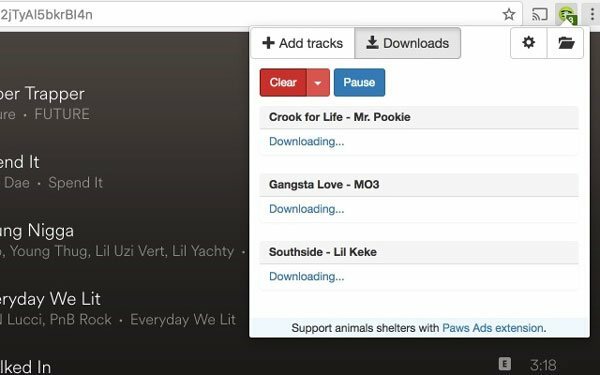 VK users can upload own mp3 files to website and name them as they like. This extension can find files on vk.com with the same name as tracks in Spotify web player. Responsibility of vk.com is to keep only legal mp3 files on their website, so this extension does only name matched search, not content based. Works on https://play.spotify.com/ and https://open.spotify.com/ pages. Support Chrome supported OS including Windows, Mac and Chrome OS. mp3fy.com is a website which allows you to download or extract songs from Youtube, Facebook, Vemeo, Soundcloud, Instagram, Vine, Dailymotion, Spotify and many more websites. Semi-Auto metadata tagging technology is used to find preferred Metadata which are then automatically tagged to the Music. Now you have a clear understanding of the Spotify music downloaders we introduce above. If you don't want to install anything or want a free solution to download Spotify songs, you are suggested to use mp3fy.com as it fits for you best. But remember that we also provide several channels for you to get a free license of all our products including TuneMobie Spotify Music Converter, you can check Get Free License page to learn the details. If you want to record songs from both Spotify and other websites, can stand with manual operation and ID3 tag editing, then both Leawo Music Recorder and Apowersoft Streaming Music Reocrder could be a good choice for you. If you focus on Spotify and don't need other streaming music services, then Spotify Music Converter is definitely the best choice because it can download a bunch of Spotify songs, albums and playlists with only a few clicks, and you don't need to manually click and click again as well as edit ID3 tags one by one.